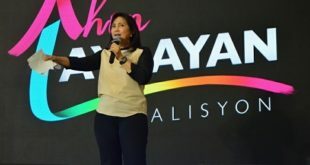 OTSO Deretso candidates, reelectionist Sen. Grace Poe, and former Bayan Muna party-list representative Neri Colmenares topped the senatorial mock elections which Cagayan de Oro-based non-governmental organization Balay Mindanaw conducted on Monday. Interestingly, Sen. Aquilino Martin Pimentel III, a Cagayanon who once ran for mayor of the city, was not in the Top 10. The Balay Mindanaw Group is one of the prominent NGOs based in the city, and has long been a recognized civil society group. 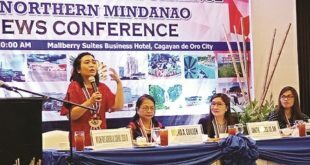 It is a Securities and Exchange Commission-registered foundation that has been articulating a sense of pride for Mindanao and passion for transforming poor and conflict-ridden communities into genuine homes for Christians, Muslims and Lumads. It does so by promoting equity-based development and sustainable peace for the past 25 years now. Women’s rights advocate Samira Gutoc, one of the “Otso Deretso” senatorial candidates had the most number of votes, closely trailed by Poe who is seeking her second six-year term while human rights lawyer Jose Manuel “Chel” Diokno secured the third spot. Reelectionist Sen. Paolo Benigno “Bam” Aquino II, a social entrepreneur, was fourth, former Bayan Muna’s Colmenares was fifth, and former House deputy speaker Lorenzo “Erin” Tañada III was sixth. All of them are “Otso Deretso” candidates. Others in the top are mutineer turned congressman Gary Alejano, seventh; former senator Manuel Roxas II, eighth; election lawyer Romulo Macalintal, ninth; and former solicitor-general Florin Hilbay, 10th. “Several others got single-digit votes, including Cagayanon and former Senate President Koko Pimentel, hence they were not in the list of Top 10,” Manlupig said. Thirty-two volunteer NGO workers participated in the mock elections.